"As close as you can sleep to the chairlifts without sleeping outside!" Totally true. The two lodge buildings are located right at the base of the mountain and are the most convenient location in the village. 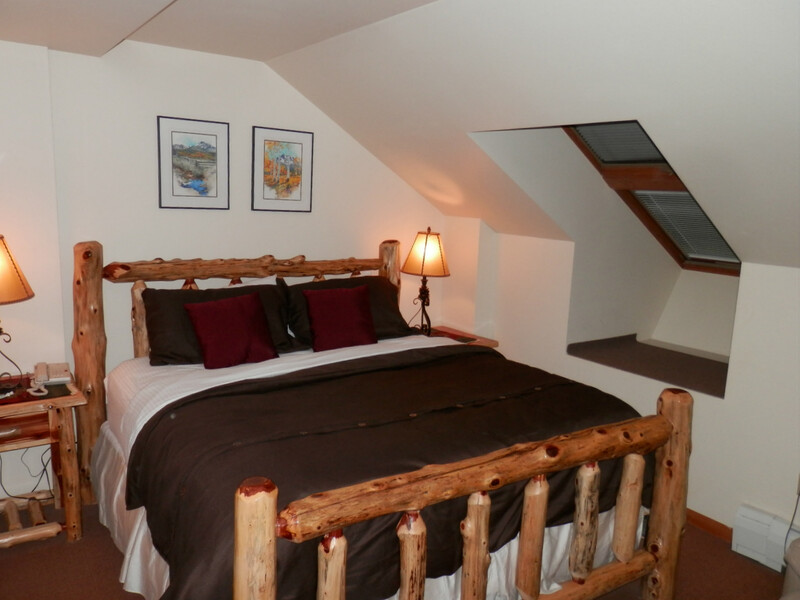 The ski rentals and lift tickets are also available in the lodge. 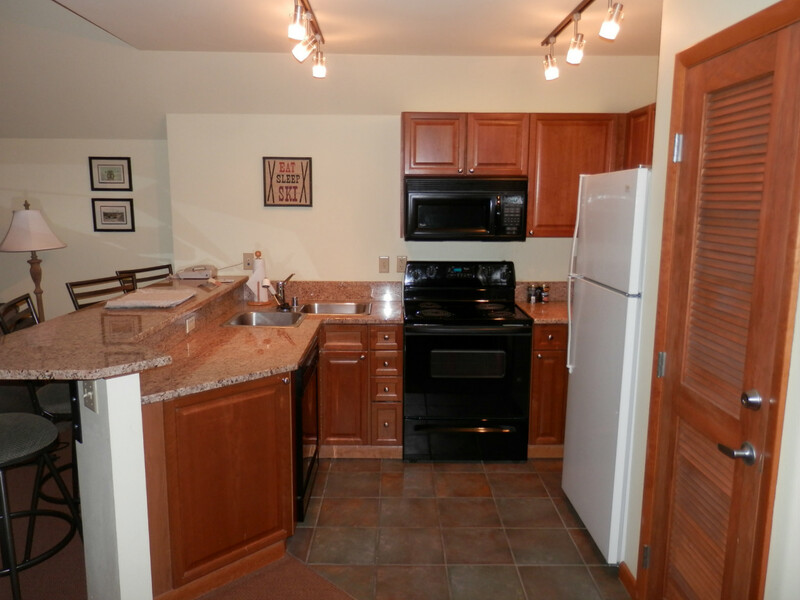 The units at Zephyr Mountain Lodge are all condo style with one, two, or three bedrooms. Perfect for groups or families. 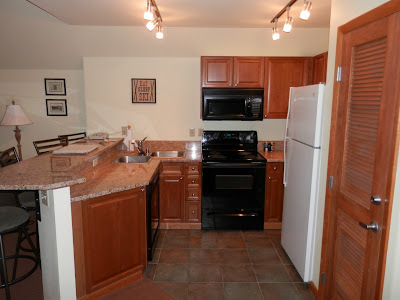 Our one bedroom unit was perfect for us! Notice the little blue car waiting at the drive up check in area! Our unit had a fully equipped kitchen. Including dishwasher! And all plates and cutlery...even a corkscrew. The living room, with gas fireplace and flat screen TV with something like 55 channels, including HD. It was great for watching baseball or a movie. Comfiest bed we have ever slept in! Well, except for our own bed in Sherman the motorhome of course! Still, it was a pretty nice bed away from home. Not a bad place to spend a ski vacation! And of course for your "apres-ski" activities, you can sit and rest your weary muscles...in the hot tub! I don't know what it is, but there's something about a hot tub surrounded by soft fluffy snow. Oh, and there's a free shuttle bus service included. So you can park your car in the heated underground parking lot and just leave it there until you're ready to head out. Simply call the front desk, reserve your spot on the bus and the driver will take you pretty much where ever you need to go in the nearby towns of Winter Park or Fraser. The driver on duty when we were there was really good...even pointing things out along the way and going out of his way to help out. Our 6th floor room had a nice balcony with a beautiful view of Winter Park Village. It all looks very expensive doesn't it? Well, it's not as bad as you might think. In fact, for what you get I'm surprised it's not more expensive than what it is. You can get a 1 bedroom for around $143 per night if you book at the right time of year. Of course it will be more expensive during the busy times like Christmas or holidays. And being able to cook your own meals it makes it worthwhile too. We really enjoyed our stay there! I'll say - way cool - love it! Sure looks like you are really enjoying the area with great facilities too. The area is wonderful and very scenic, can't wait to come back sometime and go hiking.